A touch of class is always enjoyable, especially when it is Crystal and Lace. 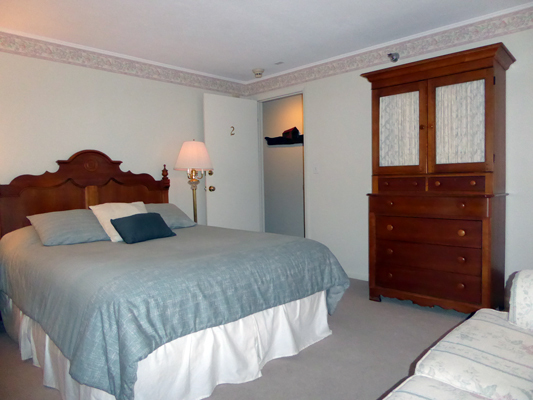 Room 2 at Birch Ridge is furnished with an Antique Lace decor and Crystal accessories. A Queen sized bed with a carved rosette headboard greets you upon your arrival. 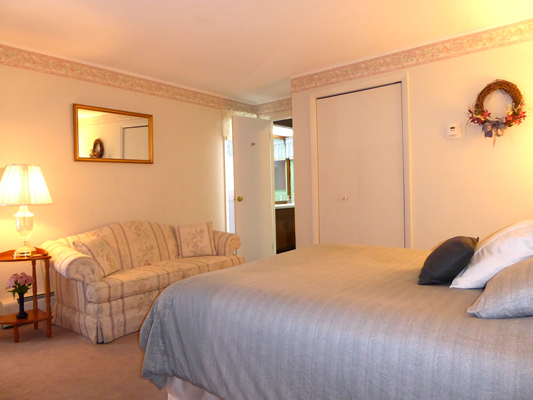 The room also features a pastel patterned love seat for relaxing. In keeping with the decor of a Vermont Inn, the television is behind the antique lace curtains in a hutch. If you do not want television in your Vermont vacation, you will not even know it is there. Like all rooms at Birch Ridge, Room 2, in addition to a HD television, also includes a private bath, an alarm clock with usb charging port, and complimentary WiFi internet access. Start planning your stay in the Antique Lace Room with our Room Rate Calculator.